As early as 1915 the New South Wales Government and the Commonwealth Government were aware of the value of war trophies as a means of recognizing the role of the Australian Imperial Force and the valour of particular battalions and individual soldiers. In February 1915 Premier WA Holman made a failed attempt through the NSW Agent General in London to gain one of over 100 captured guns for the Sydney Technological Museum. 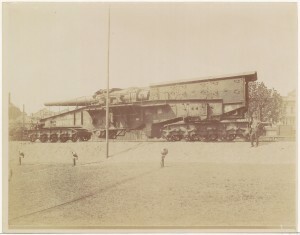 (1) It wasn’t until 1919, after the conclusion of the war that the Amiens railway gun was offered to NSW. Bridge. (9) The Commonwealth Government offered the use of a naval floating crane housed at Cockatoo Island in Sydney. 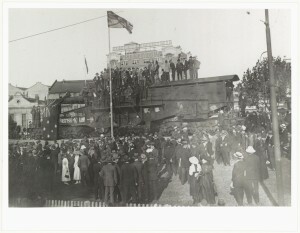 (10) The gun was eventually unloaded via the floating crane at Jones Bay in Darling Harbour. It was then hauled to Eveleigh Workshops where the gun was reassembled. From Eveleigh, the gun went to Station East Box and was then pushed onto specially prepared track work at Eddy Avenue via a ramp. The exhibit was always a temporary one as the gun belonged to the Commonwealth Government and would eventually be housed at the proposed National War Museum, now the Australian War Memorial. (13) In November 1922 the exhibit closed and by January 1923 the gun left Central Railway Station for Canberra. The gun barrel is now on display outdoors at the Australian War Memorial in Canberra and the original bogeys and mountings of the gun have been disposed of. (1) “Captured gun wanted”, Daily Telegraph, February 1915?, State Archives New South Wales: Premier’s Department; NRS 12061 Special Bundles, [7/5937], 15/981. (2) SANSW: Railway and Tramway magazine; NRS 15298/1/5/28, p. 351. 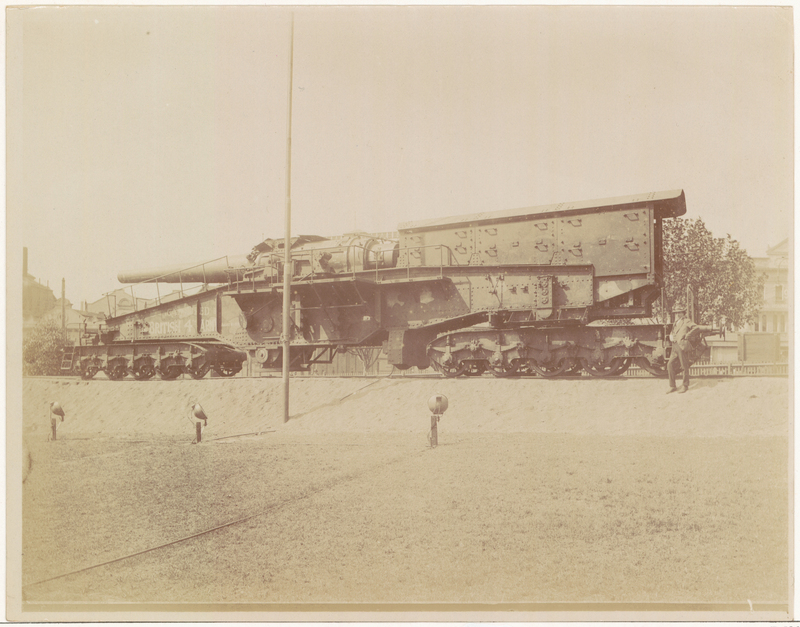 (3) Australian War Memorial: P10093.001, https://www.awm.gov.au/collection/P10093.001, accessed on 9 September 2015. (4) AWM: P01887.003, https://www.awm.gov.au/collection/P01887.003/, accessed on 9 September 2015. (5) Australian Bureau of Statistics, Standardisation of railways gauges, http://www.abs.gov.au/ausstats/abs@.nsf/featurearticlesbyCatalogue/F7D0F9DDA8F0A320CA2569DE0028B414?OpenDocument, accessed on 9 September 2015. (6) NRS 12061 [7/5937] A19/2058 29 September 1919. (7) NRS 12061 [7/5937] A19/2058 10 November 1919. (8) NRS 12061 [7/5937] A19/2058 11 December 1919. (9) NRS 12061 [7/5937] A19/2058 15 September 1919. (10) NRS 12061 [7/5937] A19/2058 Telegram 11 December 1919. (11) “Little Bertha war trophy”, Sydney Morning Herald, 27 March 1920, http://trove.nla.gov.au/ndp/del/article/15880204. (13) NRS 12061 [7/5937] War relic for Sydney, no date.